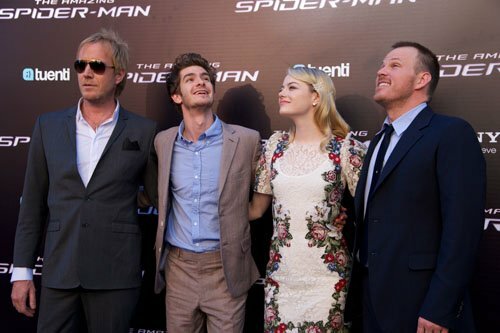 Emma Stone, Andrew Garfield and Rhys Ifans at the Spanish premiere of "The Amazing Spider-Man" . Emma Stone, Andrew Garfield and Rhys Ifans at the Spanish premiere of "The Amazing Spider-Man" . Wallpaper and background images in the Andrew Garfield and Emma Stone club tagged: stonefield emma stone andrew garfield the amazing spider-man movie premiere event 2012. This Andrew Garfield and Emma Stone photo contains business suit, suit, suit of clothes, dress suit, full dress, tailcoat, tail coat, tails, white tie, and white tie and tails. There might also be three piece suit, bridesmaid, maid of honor, well dressed person, suit, pants suit, and pantsuit.